Have you ever wondered what it is that makes people use their car to get to the gym, just to spend half an hour on the treadmill? Granted, you will find environments that are not pedestrian-friendly, or one may just live too far off the center. Yet it seems that there are more than enough circumstances where people could just use their bicycle for their way to work, take the stairs instead of the elevator or walk that mile to the shopping center. There seems to be a practical, free and less time-consuming alternative. Read on to understand how this analogy works for feedback. Walking, cycling and stair climbing is free, healthy, environmental-friendly and for most of us (and in most places) there are tons of events to witness and people to meet when using these what I call “social means of transportation”. The same pattern applies to feedback. Feedback is an invaluable source of understanding yourself and the impression you make on others. The gained input can be used to better understand social interactions, how people sense you and last but not least it is a promising way of improving yourself. So where is the treadmill? The treadmills are coaches, psychologists and smart guidebooks. People use those professionals and tools for private and professional personal improvement. At the same time, the readily available immediate feedback from friends, colleagues, family and partners is rejected. Why would people show this behavior? Accepting feedback is hard. It hurts. Bad timing. The wrong person. The wrong content. How dare people judge? All of these objections may be justified, however that does not change the fact that feedback can still be valuable. Maybe just parts of it, and maybe not even in the way the feedback was given to you. But that will not change that the other person indeed does have these impressions and opinions about you, and denial is not the best option. Once you have understood the immense potential of feedback, you will start looking at it from a different angle: It may offend you, and it way be wrong, but you can still use it to your own advantage. Scan every feedback for exploitable aspects. If there is really nothing in there, you have every right to discard it. By the way, giving feedback is as hard as receiving feedback. When you are faced with all the rejection and denial of the feedback receiver, you will need a lot of empathy and patience to get your message across. Fortunately, techniques that can help you develop better feedback skills are available. There is a comprehensive free summary of an article of Harvard Business Review: Find the Coaching in Criticism. You may also get access to the full version of that interesting article there. 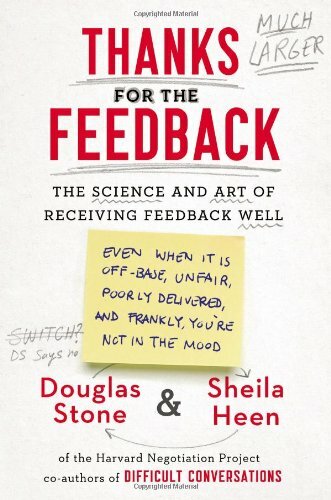 The article is largely based on the book “Thanks for the Feedback: The Science and Art of Receiving Feedback Well” (ISBN-13: 978-0670014668), which you can find at your favorite bookstore. Feedback is a great way to expose mistakes. One is unable to grow in any aspect of life without learning. You have to make mistakes and learn from the mistakes of others in order to expose opportunities. I think any feedback is great, even the worst, but it does not matter how much feedback you get. What matters is what you decide to do with it.